DETROIT (AP) -- Ford is moving production of a popular small engine from Spain to Cleveland as sales of four-cylinder motors rise. Later this week, Ford will announce a $200 million investment at its factory in Brook Park, Ohio, so it can make the four-cylinder, 2-Liter "EcoBoost" engine, according to a person briefed on the matter. The move will add about 450 jobs at the factory that now employs about 1,300 hourly and salaried workers. The factory now makes two larger six-cylinder engines. The person didn't want to be identified because the official Ford announcement won't be made until Thursday. Ford's 2-Liter EcoBoost engine now is manufactured in Valencia, Spain, and shipped to the U.S., where its sales are growing. More customers are choosing smaller engines as Ford and others offer them on more models. The engines get better gas mileage than six-cylinder motors. And they have turbochargers, which give them more power when needed. Last year, just over half the cars sold in the U.S. had four-cylinder engines, according to J.D. Power and Associates. It was only 36 percent in 2007. By contrast, cars with six-cylinder engines dropped to 32 percent from 40 percent in 2007. Industry analysts also say that making the engines in Spain leaves Ford vulnerable to high shipping expenses and the risk of currency fluctuations that could cost the company millions. Ford offered the 2-Liter EcoBoost engine in 2011 on its Edge and Explorer SUVs in the U.S., but last year it added the new Escape small SUV, the Taurus large sedan, the Fusion midsize sedan and a high-performance version of the Focus compact. This year the Lincoln MKZ midsize luxury car also was added. Two years ago, Ford sold 6,900 vehicles equipped with the 2-Liter EcoBoost engines in the U.S., but that rose to 96,000 last year, said Erich Merkle, Ford's top sales analyst. In January, Ford sold 15,000 vehicles with the engines, Merkle said. That puts sales on a pace of more than 180,000 this year. "I would expect the numbers to continue to grow as the engine continues to be applied to more vehicles," Merkle said. EcoBoost is Ford's marketing terminology for a turbocharged engine. Turbochargers pump high concentrations of air into the piston chamber. That allows more gas to be sent in and offers extra acceleration or hauling capacity whenever drivers step on the pedal. Turbochargers aren't used under normal driving conditions, so the engines get better mileage because they behave like normal four-cylinder motors. An Explorer SUV equipped with the optional 2-Liter EcoBoost engine puts out 240 horsepower and gets 20 mpg in the city and 28 mpg on the highway, according to U.S. Environmental Protection Agency estimates. That's 17 percent better than the Explorer's base engine, a 3.5-Liter V-6 that puts out 290 horsepower and gets an estimated 17 mpg in the city and 24 mpg on the highway. Still, turbos can drink a lot of gasoline when a driver has a heavy foot. Earlier this month, Consumer Reports magazine warned that they might not deliver the speed or fuel economy that people expect. Michael Robinet, managing director of IHS Automotive, an industry consulting firm, said carmakers often import engines from other countries until they see if they catch on with customers. In Ford's case, it's well worth it to build the 2-Liter EcoBoost engine in the U.S. The move to Cleveland also could create more jobs in the U.S. as parts companies ramp up to supply Ford, he said. On Thursday, Joe Hinrichs, Ford's new president of the Americas, will be at the Cleveland-area plant for an announcement, joined by United Auto Workers officials and local politicians. The company would say only that they'll "discuss Ford's investment commitment and product plans for the Cleveland Engine Plant." 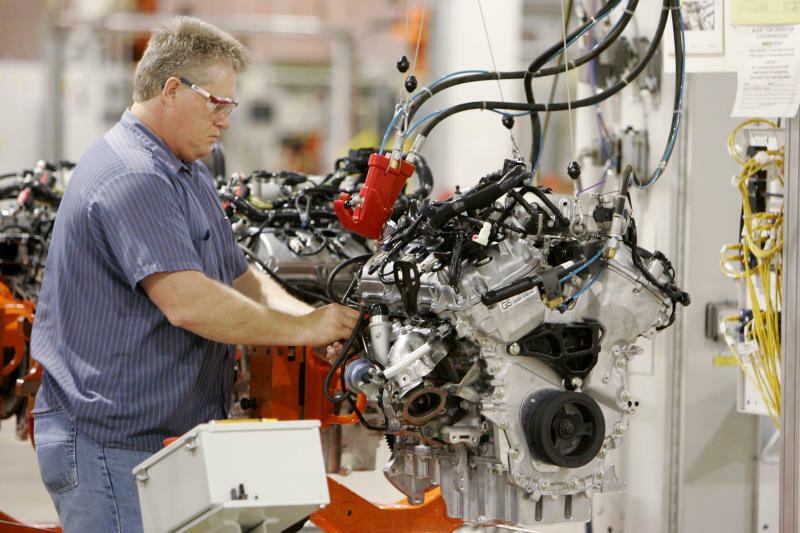 The Plain Dealer newspaper of Cleveland reported Monday that plant workers approved a new contract that guaranteed another engine for the plant, most likely a four-cylinder motor. Mike Gammella, president of the UAW at the Cleveland Engine Plant, said all he was told was that the factory will get a new line of smaller engines. Currently it makes the 3.5-Liter EcoBoost and 3.7-Liter V-6 engines. The EcoBoost V-6 is becoming popular in Ford's F-Series pickup truck, the country's top-selling vehicle. Gammella said getting the 2-Liter engine would go a long way toward ensuring that the plant has a solid future with Ford. "If we get this motor, it's just going to be huge for any facility," he said. "It's going to be a high-volume motor and it's going to be a very major part of anyone's product line for the next 15 to 20 years."